At first, when I looked at the cover, I got a feeling of something mysterious or supernatural. At least the dark hue of blue and the forest signalled so. But very soon, the bird, violin and the title hinted the otherwise. As they say, one can never judge a book by its cover! Poetry has the ability to uplift our mood and transport our heart to faraway places. It was on a boring, rainy afternoon that I picked up Purba's book. Listening to the sound of raindrops dancing on my window, in no time I found myself lost in the world of love, longing, pain and memories. "The Heart Listens to No One" is a collection of 35 poems about love. Purba rightly mentions that the heart listens to no one, for it is governed by love. Each poem is like a spice in a spice box, adding its distinct flavour to the dish of love. So, while reading "The Soul Tale", one is reminded of that first magical meeting that transforms the lives of two individuals. "Painting" depicts how love paints the canvas of heart with colours of commitment, care and passion. "kaleidoscope" tells of that moment in love when eyes do the talking and words lose relevance. Reading "Musical Silence", I could imagine myself sitting next to lovers on a starry night, witnessing the music of silence, when feelings are miles ahead of expressions. "A long winter night is all about preserving memories of precious moments. Having retained many sarees worn by my mom, I know how old clothes and characteristic fragrances ring in nostalgia. Being sincere in a relationship also amounts to watering the memories, so they become immortal. For each union, there is also a separation. Time flows like a river, transporting the once inseparable lovers to different shores of life. Often, the separation isn't pleasant (Well, when has separation been good, anyway?). Sometimes, the very same gifts that remind us of the good moments are like thorns pricking us every now and then by their presence. The traces of the burnt days then, have to be wiped out (Traces and fragments). Since Purba has been wise enough to divided the book into themes (Love, longing, Romance, fond reminisces and separation), one doesn't feel as if reading a book. Lost in the world of love, I felt as if I was a spectator in a theatre, witnessing a romantic play! The beautiful words magically weaved the imageries, like the scenes of a play. If you enjoy reading romance, the section "romance" will find a place in your heart; when a mere gaze makes up for love letters and moments spent apart. It is amazing how one can experience the joy of a lifetime in those few moments spent with her beloved. But then, such is the magic of true love! If you have ever been in love, the book will take you to the magical world, where soul is the boss and love, the only logic. If you are yet to be lucky with love, the poems like raindrops will sprinkle the divinity of love! This is Purba's first work that I have read and I am impressed by her ability to express the most intense emotions so effortlessly. Real beauty lies in less and simple and going by the simple language and short poem format, she has used the simplicity well to her advantage. The poems strike an instant chord with the readers. Some tickle joy when they rekindle memories, while some strike the blow of refreshing unpleasant memories. I would have really loved if the cover spoke about love as much as the poems did. Purba Chakraborty is the author of two novels “Walking in the streets of love and destiny” (2012) and “The Hidden Letters” (2014). 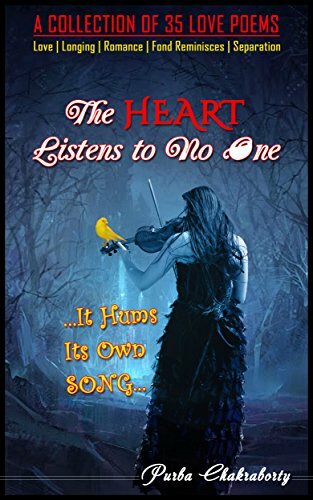 “The Heart Listens to No One” is her first poetry book. She has also contributed her poems and short stories in several anthologies such as “Rhymes and Rhythm”, “Minds @ Work 4”, “Kaafiyana”, “Mélange~ a potpourri of thoughts”, “Fusion~ a mingled flavor mocktail”, “Stories for your Valentine” etc. You can visit her blog www.reverieofpurba.blogspot.in to read more of her writings. Thank you so much dear for your discerning review. I really loved the way you talked about the poems in your review. Your comparing the book to a romantic play touched my heart. It is one of the best and unique compliments that I got for the book. Thank you for your time Shaivi and I am so glad that you enjoyed reading the book. Much love! Nice review. Since your appraisal runs like poetry, I can understand how much you're impressed by the book. 4.5 ... This means the poems must be great. Loved coming back to your blog.